TV’s, DVD/Blu-Ray Disc player, Network Media player, Amplifiers, In-wall speakers, and Sub-woofers, Theater seating, and Custom enclosures to indeed duplicate the movie theater experience. Ideas are endless. Whatever type of system is best suited for you, we can provide it. 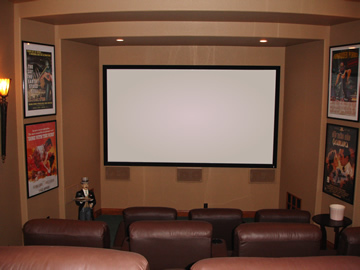 The term “Home Theater” can be intimidating an In-Home Consultation will help us to create the Home Theater that best fits your needs & desires.